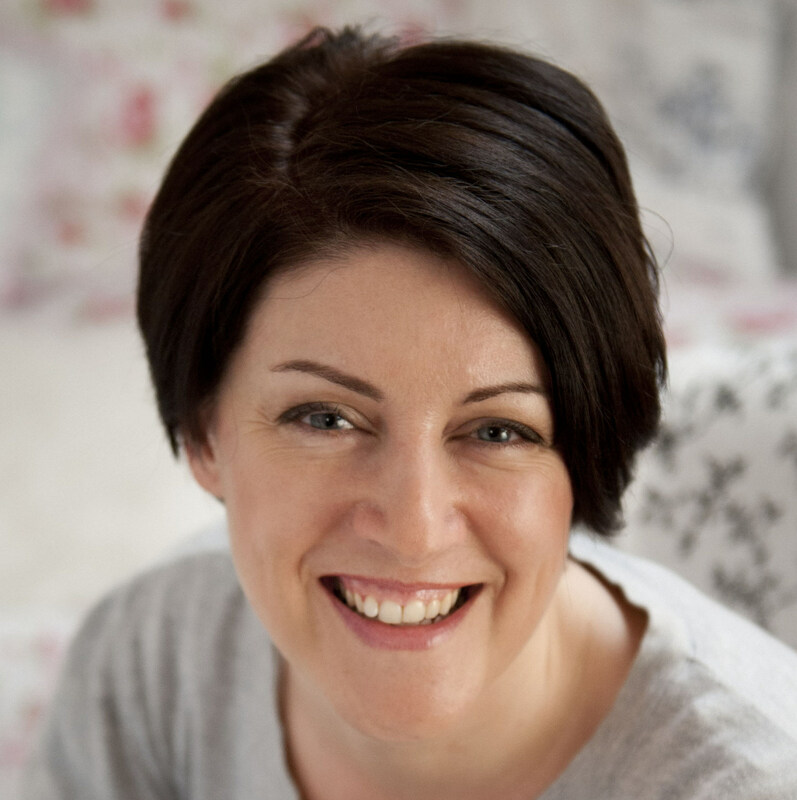 Today I’m delighted to have a very special guest on the blog – author Alison Morton is here as part of her blog tour to celebrate the launch of Perfiditas, the sequel to Alison’s critically acclaimed first novel, Inceptio. The applause at my performance? I’m talking about my first book launch, of course! Whatever efforts I make online to sell my books, the milestone event for me is a real world launch. If you’ve slaved away on the second book, drafting it in the shadow of the first and dedicating all your spare hours since the first was out, you need to celebrate! 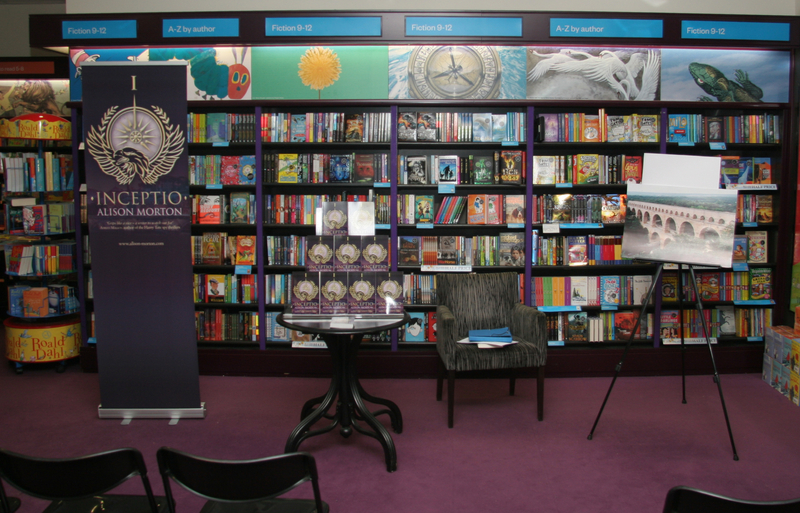 A launch doesn’t have to be a Foyles Literary Lunch, nor in a bookshop, nor need hundreds of attendees. A writer friend of mine booked a double table at his local pub, invited a few friends and ended up speaking to the whole pub and selling over a hundred books. If your book relates to a place, you could launch from tourist bookshops, hotels, boats, club venue, museum, or a friend’s garden, art gallery, or community centre – in short, anywhere where potential buyers might gather. 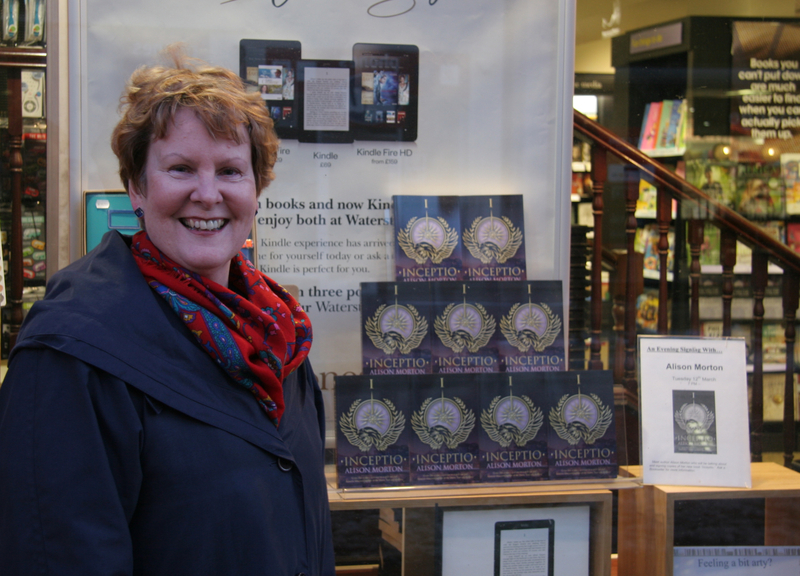 Me outside Waterstones with the INCEPTIO window display which shows you can do it! So what happens at a launch? 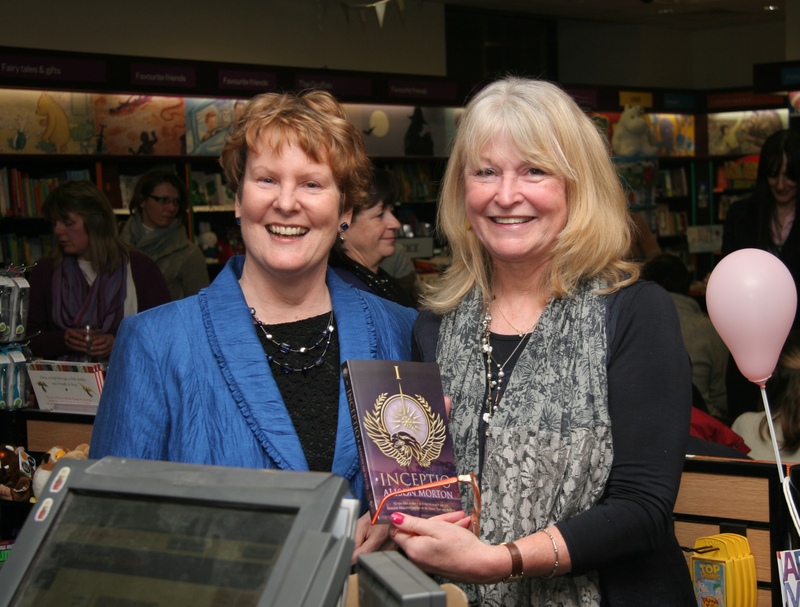 Some are like standard parties – milling, lurking, laughing, but centred around the author and the book. 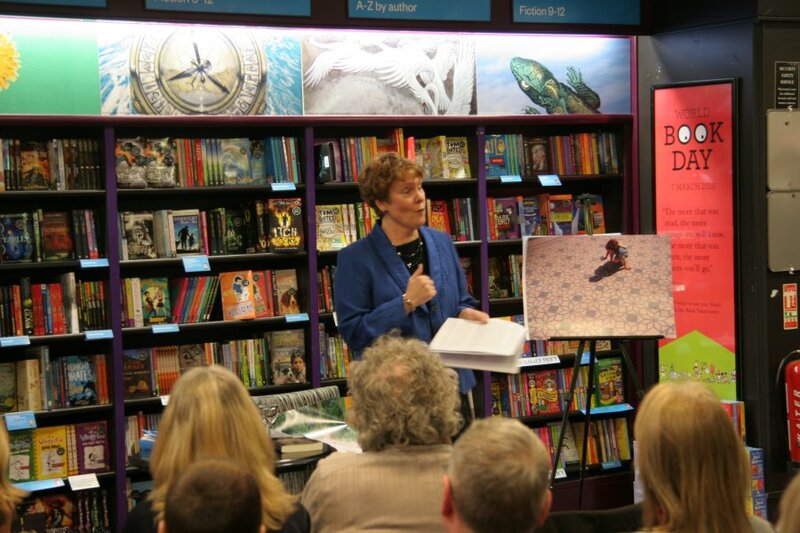 A five to ten minute pause will allow the author to thank everybody, read a short extract and invite the publisher and agent (if any) to say a few words. Then attendees can buy copies and queue for the author to sign them. 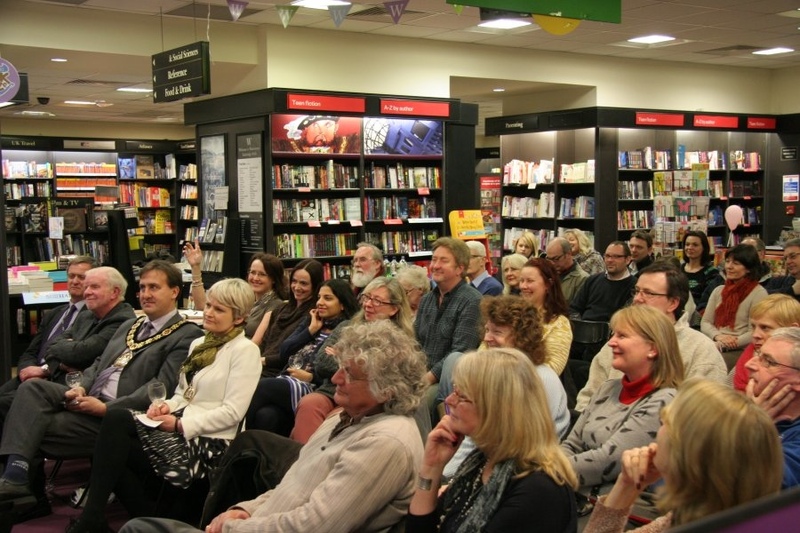 A more structured launch, sometimes called ‘An evening with [insert name of author]’ is ticketed – usually at a modest amount redeemable against the cost of the book. Attendees are offered a glass of wine, fizz or soft drink on arrival. After five or ten minutes’ mingling, they sit down to listen to the author give a talk for 25-30 minutes including an excerpt from their book. A question and answer session follows, then buying and signing and a little more mingling. This is what I did with my first book, INCEPTIO. But how is a second launch different? 1. Don’t wait to start planning. Although a beautiful book is a pre-requisite, you must think about where, how and when as soon as you’re even thinking of publishing your book. 2. Network in real life at conferences, courses and events, and virtually on Twitter and Facebook. Try to meet as wide a circle of people as possible. Apart from the pleasure of talking with new people and learning new things, you may come across published authors in your genre or known specialists in your field. Ask them for their thoughts, their advice, but in a polite way. Who knows, they may come to your launch and add some magic dust. You will have by now built a fan base from those who bought the first book and interact with then via your blog, Twitter and Facebook. These are your ‘champions’ who will help promote the second book. Be nice to them; tell them what you and your first book have been up to and stay in touch. 4. Before making an approach, ensure you or your publisher has already loaded your book on to Nielsen Bookdata so that the shop staff can check you are a pukka author. Have your Bookseller Information Sheet in your hand and a good quality business card with your contact details. Prepare your ideas for getting the audience in – your friends and more importantly, the general public – and how you’re going to publicise the event. And if you have got a ‘name’ to agree to come along to your launch, mention this as part of your pitch. 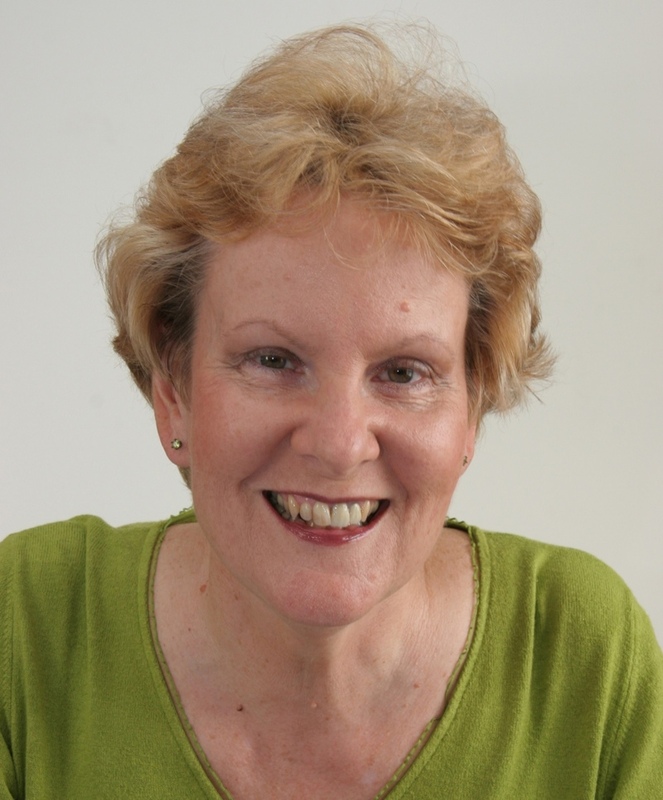 If you have been a friendly, co-operative and approachable author and had a successful first event, you won’t have to go through this hoop again. I live abroad and can’t pop in anytime so I paid special attention to staying in touch. I sent an email about four months before my planned date, telling the events manger about INCEPTIO’s progress, and awards, and tentatively booked a date for PERFIDITAS. I made a point of visiting the store in person a month later – I was in the UK speaking at a conference – to chat and confirm details. 5. The key to a successful evening is, rather predictably, preparation. Write your talk, speak it aloud, condense it on to cards, but practise it. Make sure the launch venue has glasses/plates/bowls or take your own. Do offer a drink, both alcoholic and soft. You don’t need fancy canapés; good supermarket nibbles are fine. Take plenty of postcards (you can put one on each chair beforehand), bookmarks, pens, etc. and a guestbook. Exactly the same, but you need less food than you think. 7. And smile. The audience has come to see you. They want to hear what you have to say. And they can be incredibly lovely when they queue with their book for you to sign. 8. Always sign the title page, never the cover or a blank leaf. Check how names are spelled. Be very careful of Nicky/Nickie/Nikki/Nic and don’t let’s talk about all the Kate/Catherine/Kathryn permutations. 9. Arrange for somebody else to take plenty of photographs especially of you holding your book, or high resolution printed image if an ebook. You can then use these photos to publicise your book further! Me and Sue Cook at the till! 10. Post photos on your blog, Facebook pages, send a brief write-up to the local paper and monthlies’ social pages. The second launch is not the same unknown, but it’s scary in different ways. Friends who came first time may not bother this time, although those who couldn’t make the first launch may come to this one. The big trap is thinking that now you have one big event under your belt, you can wing it – see point 5 above. But once everything’s ready on the night and it’s five minutes to go, take a deep breath, smile and prepare to enjoy it. Alison’s second book in the Roma Nova series, PERFIDITAS, has just been published in paperback and ebook formats and she’ll be launching it at Waterstones Tunbridge Wells on 6 November. Do go along! Thank you for such an informative post. There’s so much useful information here for indies planning a launch – big or small. Definitely worth sharing with other authors. Good luck, Alison! Thanks, Helen, on all counts. It’s all about lists and being organised. I hope it helps. Thanks so much for having me on your blog, Joanna.